Have you ever seen a bald eagle up close and personal? Watched it raise its enormous wings or throw its head back and cry out a chatter call so intense that you can physically feel it? I recently got the chance to do just that. This one is definitely going on my short list of cool bird events. 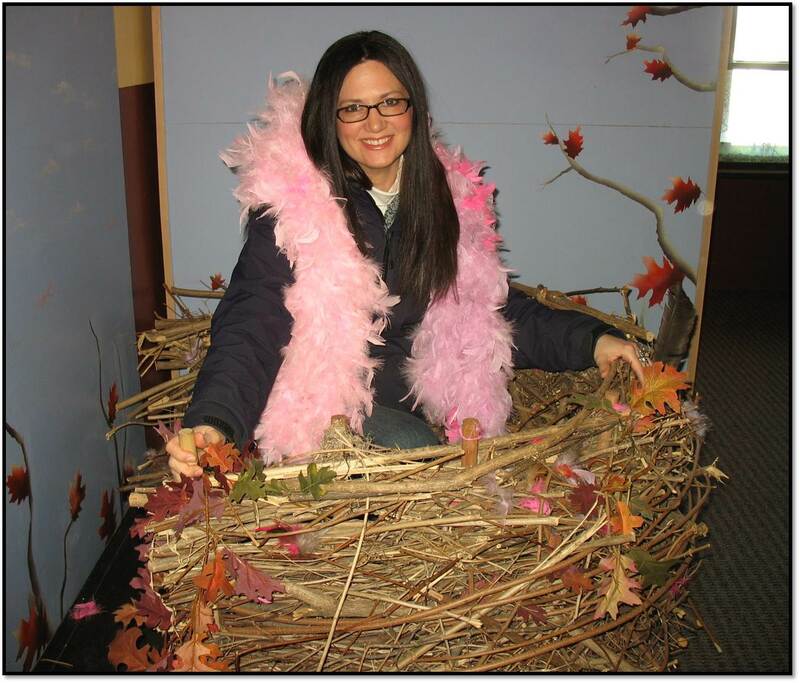 On Saturday January 26th, I attended a SOAR (Save Our American Raptors) event in Yorkville, IL. I was aware that the education program would be geared towards younger audiences but that certainly did not deter me from wanting to see raptors and learn something new. The program was led by George and Bernadette (Berni) Richter, founders of SOAR. 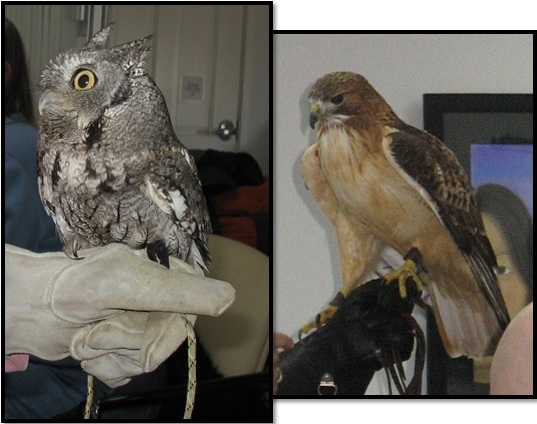 They are federally licensed master falconers, raptor banders, breeders, rehabilitators, and educators. After telling us a bit about their organization, Berni led a fun and informative session on birds of prey. As if being a bird rehabiliator wasn’t already enough for me to admire her, she really won me over when she was temporarily distracted by two raptors flying around outside, she just had to pause for a second and take a look. I’d have done the same thing. Throughout the program, we heard fascinating stories about migration and tracking, like a peregrine falcon found in Ottawa, Illinois tracked from Greenland. We also heard stories about raptor misconceptions, like a farmer who thought that a chicken hawk had been killing his chickens. Ready to kill the chicken hawk, he discovered that the hawk had caught a weasel, the true villain of the chicken massacres. We also learned about our impact on birds, like the barn owl that is endangered in Illinois. When we change the structure of barns, we impact their ability to build nests. When we poison the environment to reduce rodents, we impact their health and ability to find enough food. Berni starts the program and later explains the basics of feathers as I sit and wonder how I might get my hands on that collection. Basic anatomy was addressed, including the raptor’s unique binocular vision to accurately judge distance. Unfortunately this is when they are at the greatest risk of being hit by cars. When they are so focused on prey, they may not see a fast-approaching car in their peripheral. We learned more about raptor diet, division of labor among the sexes, migration, and grooming. A new factoid for me, vultures defecate on their own legs. If you didn’t already know that, you do now! Stomach acids excreted in the waste help sanitize the area and kill microorganisms that the bird picks up from carrion. It is amazing that creatures in nature simply know what to do to care for themselves. It’s a stinky but effective process. After covering a wide variety of raptor facts and figures, Berni and George carefully moved a crate forward that looked appropriate for containing a few Great Danes. With bated breath, we watched them open the crate door and set down a ramp. 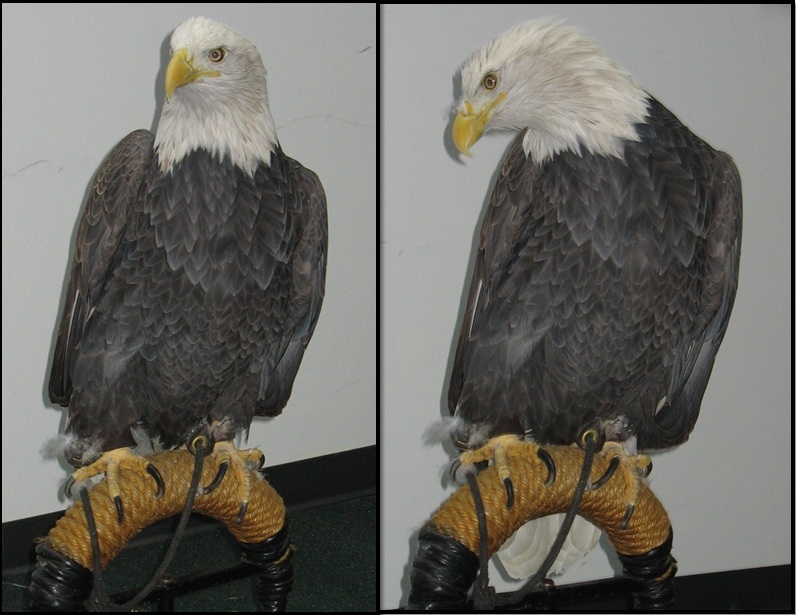 As they explained that this bird was too big to lift up and perch on their glove, out came an adult bald eagle. With a collective gasp from the audience, “Deshka” took several steps, opened her wings, and threw her head back as she called out. The whole group was awestruck. It is something you need to experience for yourself in order to appreciate the profoundness of this bird. Deshka, named after the Deshka River in Alaska, fell out of her nest and broke her wing. Fisherman, who originally spotted her on the ground, saw her in the same spot days later and realized something was wrong. They were able to capture her and take her to get help. Her wing did not heal properly and she is unable to fly. Berni told us all about how they came to acquire Deshka and gave us colorful descriptions of the arduous efforts it took to get on the eagle’s good side. Three other raptors came out to inspire and help educate. There was Damsel, a peregrine falcon. These birds hunt from 1000 feet in the air or higher to almost exclusively catch flying prey, and can fly up to 200 mph in a dive down at their prey. Avid voyagers, these birds can rack up a staggering amount of frequent flyer miles in an average lifetime. We also met Candy, an imprinted eastern red-tailed hawk. There is a lot of diversity in the looks among different types of red-tailed hawks. A screech owl that had been hit by a car closed out the demonstration. I was surprised by just how small this adult female appeared despite the fact that she is considered large. George with Damsel, a peregrine falcon, and Deshka the bald eagle. In addition to general bird education, Berni and George emphasized what we can all do to help these birds, and as importantly, what we should not do that will help these birds continue to survive and thrive. It was a great presentation that I hope many groups and organizations will add to their programs. I encourage anyone involved with schools, clubs, nursing homes, and religious organizations to contact SOAR or your own local wildlife rehabiliator to coordinate unique, fun, and informative programs in support of wildlife. Not five minutes later in the car after the event, this little bird spotted a very large bird with a white head and dark body going westbound over the Fox River in Yorkville. What are the odds that one would “meet” a bald eagle in person and then just happen to see one minutes later cruising over head? I could never have fished my camera out of my purse in time to capture the moment so I just slowed down a bit and watched it go by. I would very much like to believe that this was more than a coincidence.